My Pick For The Best Cash Back Credit Card + $200 Sign-Up Bonus! Today I’m sharing my go-to credit card for earning cash back on regular spending. When I’m not trying to earn lucrative sign-up bonuses for travel with points and miles, I’m looking to earn the most cash back possible on my everyday purchases! Gives you access to Amex Offers to save even more! I prefer cards that don’t have an annual fee, of course. There is a version of this card that has an annual fee and earns double the cash back. With that card, I’m held to spending a certain amount on the card to justify the fee, and I don’t want that! Since most of my everyday spending is at the grocery store and gas station, this card is a great choice for me. I earn 3% back on the first $6,000 I spend on groceries annually which adds up to $180 back each year. If you sign up through any link on this page (these are my referral links), then you’ll earn $200 cash back after you put $1,000 on the card in the first three months. This is an increase from the $150 that is available to everyone! And lastly, if you have an American Express, you can take advantage of Amex Offers to save even more! Here is a screenshot of the Amex Offers I’ve redeemed in the past year. As you can see, I’ve saved an additional $95 off my purchases including wine, groceries, and Disney World park tickets from Undercover Tourist! 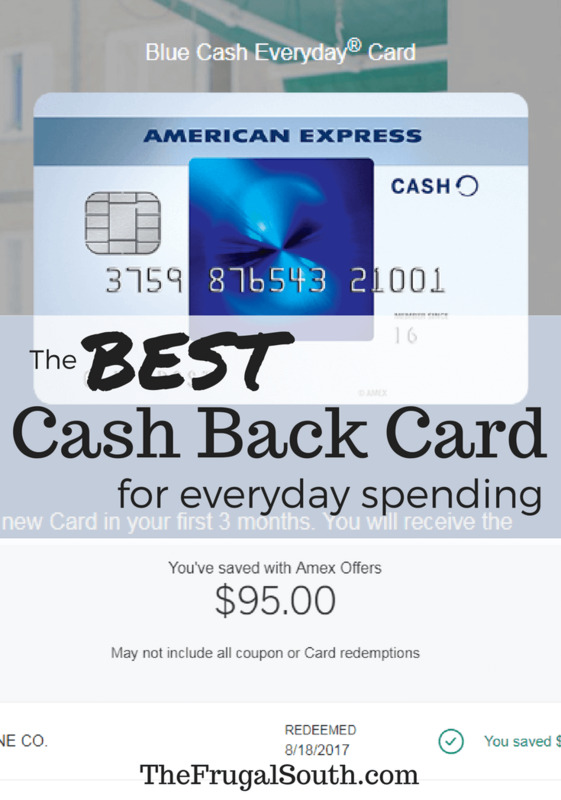 For all of these reasons, I highly recommend the American Express Blue Cash Everyday card as a cash back card. If you do happen to carry a balance (which I don’t recommend), you’ll be able to pay it off over time. Any questions about this or other cards? Leave a reply on this page or send me a message on The Frugal South’s Facebook page!